The ancient mummies that were damaged a week ago in Egypt's political uprising - along with the 70 objects that were also vandalized - become the symbol of the world's concern for Egypt's cultural heritage. Pictured above are the heads lying on the floor with scattered broken bones. 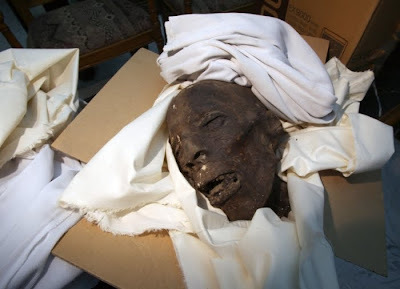 They remain unidentified, but researchers speculated - based on a cartonnage case that had also been thrown to the floor - that they were the mummies of King Tutankhamun's great-grandparents. "We all feared they could be Yuya and Thuya, but the pictures proved they weren't," said blogger Kate Phizackerley. In fact, the bones in the photo apparently do not belong to the heads, which are Late Period fragmentary mummies used to test the CT scanner and stored near the machine. "Quite certainly we are talking of non-royal mummies," asserted Swiss paleopathologist Frank Rühli. My friend Australian Egyptologist and anthropologist Jasmine Day, whose book The Mummy's Curse: Mummymania in the English-Speaking World I reviewed, concurs: "Many of the royal mummies have distinct facial features and even intact hair. 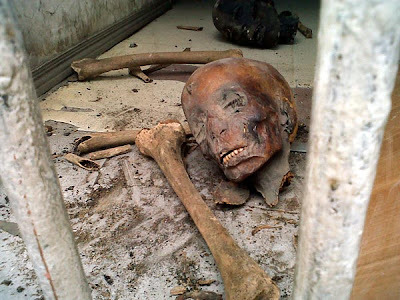 The damaged mummies and bones appear to have been knocked accidentally - or tossed vindictively - off a table or shelf in the darkened storeroom." Even though they are not the bodies of pharaohs, they certainly deserved more respect. As Day observes, "It is tragic to see Egyptian mummies treated once more in the cavalier and cruel fashion in which tens of thousands of their fellows were once treated by ancient Egyptian tomb robbers and Victorian souvenir hunters. I never thought I would witness such things in my lifetime." While I was writing this post, news broke that Egyptian president Hosni Mubarak will likely step down tonight.